The colder than normal December is verifying for the majority of the country; however, many in the Northeast and Mid-atlantic are beginning to wonder, will winter ever show up this year? While we have seen some transient shots of cold air – one such airmass overhead right now – there hasn’t been any sustained, well below normal air over the Northeastern part of the US. The pattern thus far as been conducive for the development of Western/Central US troughs, via the very low height field encompassing the Arctic and North Atlantic. The slightly favorable North Pacific regime – a +PNA/-EPO – has allowed for some jet bucking in the East, but for the most part it’s been a “dangle the carrot tease” type of pattern. The bulk of the polar/arctic air has remained locked up over the northern plains and Canada. As long as we continue to see a low height field in the Arctic/north atlantic (+NAO/+AO), it will be difficult to achieve sustained colder than normal temps and/or snowstorm threats in the Northeast corridor. The slightly positive PNA will persist for the next couple weeks, so that will at least force some cold air into the northern tier, creating a tight west to east baroclinic zone from the Plains into the Northeast, aka a gradient pattern. 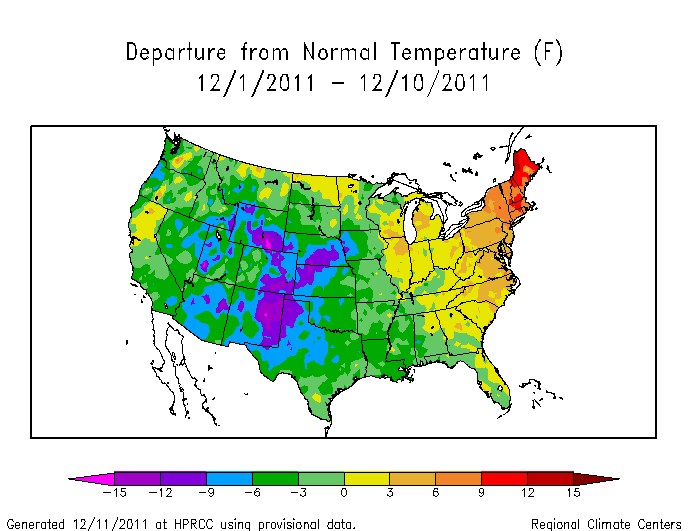 Good examples of gradient patterns are December 2007 and December 2008 – both Nina years – and both featuring many southwest flow events, that is, storms moving SW-NE along the tight thermal boundary separating the relative warmth over the Southeastern US from the relative chill over New England. The NYC metro area will find itself in this battleground zone for the next couple weeks, and with any luck, that zone will shift far enough south to perhaps provide a white Christmas for parts of the area. I’m more confident on areas NW of NYC seeing accumulting snow before Christmas – as far as the coast – I don’t believe the global regime shift will have responded to impact sensible weather just yet. Is it possible to get a white Christmas on the coast? Yes, but we need to hope for a temporary shift south in the Canadian Polar vortex, to force that baroclinic zone safely south of our region. An illustration of our pattern through Christmas. This is the ECMWF H5 map for days 8-10. So for the NYC area and the coastal corridor from DCA-BOS, anticipate a fairly typical Nina pattern through week 2, including rain events followed by shots of polar air, averaging out near normal temp wise overall. Now, beyond that time frame – there is controversy as to whether blocking will ever show up this winter. As I’ve stated a few times since my winter outlook this fall, the question for me is not IF the blocking will show up, but WHEN. Initially, a few months ago, I thought it’d be December into the first half of January, but now I believe it will be the end of December through most of January, and I’m going to explain why (I think) the original time frame likely failed. 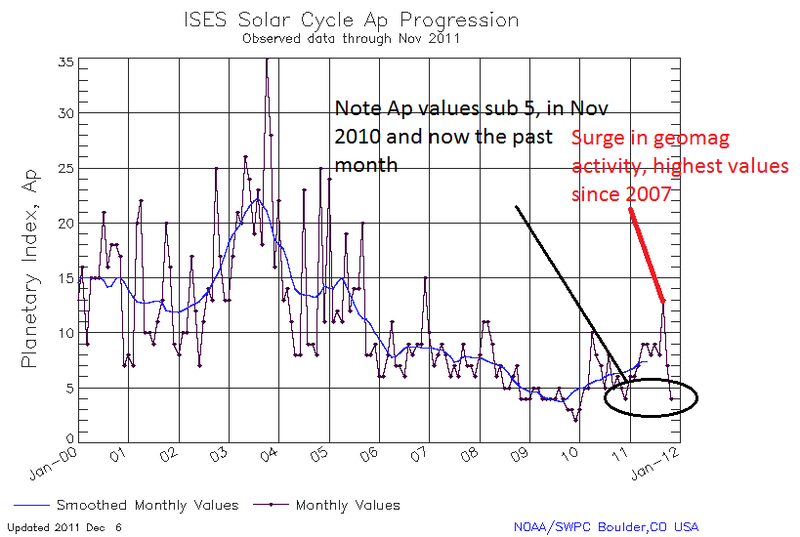 Note in the following image, the Solar cycle Ap index progression with the purple dots denoting monthly values. Geomagnetic activity has generally been below 10 since 2007, but in the Sep-Oct period, we saw a surge in activity up near 15 which likely aided in the development of a strongly positive +AO/NAO regime for the month of November into early December. However, notice how last year, we had a drop off in values just prior to December, preceding the major NAO blocking event. This year we have the same, but geomag activity has been much higher this autumn compared to last autumn. With that said, considering values have now been consistently below 5 over the past month, the tropospheric response should occur sooner rather than later. Furthermore, solar flux was high in the Oct-early Nov period, relative to recent years, which added fuel to the fire in terms of +AO/NAO maintenance. Solar flux is now falling down from its peak near 180 to around 140 now, and sunspot number (less important for blocking) is also falling. While this has delayed the blocking thus far, as noted above, current values on both the geomagnetic and solar flux data suggest an initiation of negative AO and NAO fairly shortly (by the end of this month). Stratospheric conditions will also be changing over the next few weeks, with a slow but steady warming of the 10mb-50mb layers initiating in Eastern Asia/north pacific and eventually propagating northward towards Alaska and into the Arctic Circle. I’m utiziling the potential warming event as another factor for the blocking, but if a major warming does not happen, I don’t believe that’s necessary for the NAO and AO to turn negative by the end of this month into January. Note the brighter oranges developing near Alaska, indicative of a warming occurring. At this point, the warming has not spread over the entire Arctic, but it is a definite step in the right direction, which should take another 1-2 weeks to fully realize (meaning the full warming probably taking at least 3 weeks to materialize). So how will our sensible weather be impacted? 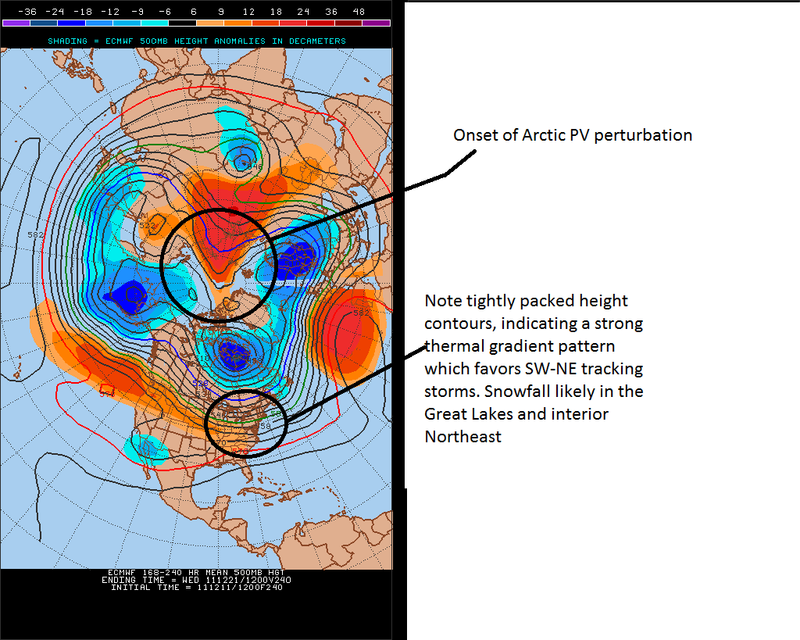 1) The next 2 weeks – through Christmas – anticipate a gradient pattern with storms favoring the interior Northeast. Temperatures will average out near/slightly below normal with surges of mild air ahead of inland tracking lows and surges of polar air following these same lows. Essentially we’re talking a back and forth temp regime with precip chances every several days or so. 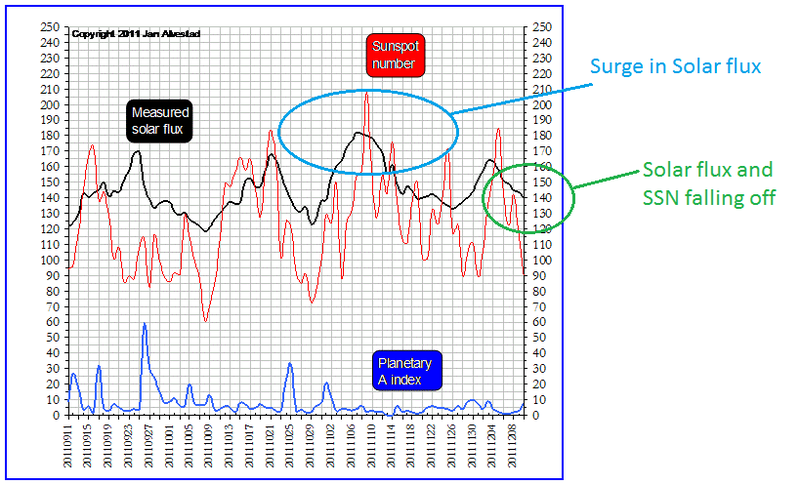 2) The onset of a global regime change should initiate by week 2, as geomagnetic and solar flux values argue for a height rise across the top of the globe. This argument is further strengthened if a stratospheric warming event occurs, the signs of which are showing up now – warming spreading from the north pacific into Alaska and the arctic circle. 3) Negative AO and NAO development by week 3, after Christmas and around New Years. Due to the delayed initiation of the blocking, January could be a much colder month than forecasted in the winter outlook. Whether it persists into February depends upon its initiation time frame. Obviously a later change to persistent colder weather would mean February could be interesting. 4) White Christmas likely for the interior Northeast – up for grabs in the I-95 corridor. If we can get the polar vortex to force a low tracking south of the region, then maybe, but I wouldn’t get my hopes up given the full realization of the new NAO/AO regime shouldn’t occur until after Christmas. 5) December will finish colder than normal for most of the country, save for the Northeast/Lakes, due to the excessive warmth we’ve seen thus far, it will be difficult to erase those departures (unless we can get major cold into our area by the last week of December, which cannot be ruled out). The main point to underline is the next 1-2 weeks are a continuation of the Nina regimes (back and forth), week 2 into 3 is a transition period (Christmas), and much more interesting pattern should unfold thereafter.